Last we left off, there was the threat of an Armageddon-level virus running through the veins of our titular characters as they happily, unbeknowingly, went on with their fake lives. The cure secretly lay in their child, Josephine, and the Supreme Tri-Mage Ryan, despite having lost during the events of YOTBR, still holds his rule. Things seem peaceful, but a single act can begin a chain of events that will forever change the face of Heaven’s Fence. Today, we dive into the first two albums from Coheed and Cambria, Second Stage Turbine Blade and In Keeping Secrets of Silent Earth: 3 on our journey towards Vaxis – Act I. Shall we? The first full-length release from the band was released back in 2002, introducing fans to the world of The Amory Wars for the first time. Despite the failings of the bag.on.line.adventures, Claudio persisted with his endeavor into comics. Under his new brand, Evil Ink Comics, he officially began his publication with a five-part mini-series on the first half SSTB in 2007. The success of this led to a second five-part series, collecting the whole into a hardcover graphic novel. Given the format, the story tends to jump between characters frequently, using the medium’s strengths to its advantage. As such, the story is a little messier when condensed. A quick aside before we start, there is a good analysis of the second half of the story/comic here if you want a bit more of an expanded story. Let’s get to it! A bad dream chock full of foreshadowing awakens Coheed Kilgannon into his mundane life with wife Cambria and his children. As early as the first chapter, we see Deftinwolf return to spoil the illusion, confronting Coheed about his past. He tells him briefly of his history in the KBI and the memory wipe, explaining that the Monstar virus he has mutated into the Sinstar virus in his children – one without cure. The only option left for the two parents is to kill their children, a plan they eventually resign to. Poison takes the two youngest, and a hammer takes Josephine. Her twin, Patrick, escapes while Claudio, Newo, and Apollo stargaze. Meanwhile, Wilhelm Ryan and Deftinwolf conspire to put an end to Coheed and Cambria, currently their only roadblock in their plans, and continue to direct them to Paris on Earth. They speak ambiguously of ‘flies’ and the priests that will take care of the couple. An incident with a premonition Cambria has causes Coheed to go berserk, and there is a confrontation at the Kilgannon house with a priest in which they get captured. Claudio returns to the aftermath at the house, reviving the fallen Josephine with newly awoken powers. The priest attempts to charge him, and he uses the hammer to keep it down. Josephine dies again slowly while the priest rises, and Claudio leaves with more awakening abilities. Patrick escapes another priest, Inferno stands trial among the Prise, and the Kilgannons awaken to their memories. They lash out aboard their transport, killing many. We then learn briefly of the Mage War from YOTBR, and that the fallen mages were turned into the Onstatine Priests. Ryan intends to use the virus to kill Mariah, an immaculately conceived and powerful mage that would lead a rebellion against him. The couple’s vengeance aboard the Gloria Vel Vessa continues, Patrick is chased again by the priest and is murdered, Claudio continues to hide with his new powers aboard a garbage collection ship, and Inferno attempts to intercept Ryan’s ship. Elsewhere, one of the Prise, Ambellina, is seen burning her hair and wings on Star IV to begin her mission. Fearing the prophecy and inspired by the priest’s work, Ryan continues to promote another of his men, Crom, into more assuming stations, and demoting Deftinwolf to focus on his task with the flies – a large vat containing a swarm of dragonflies. Mariah leads her rebellion to the steps of the House Atlantic, and Inferno’s plan/the Kilgannon’s efforts fail as the ship is nearly taken in before the Grail Arbor fires upon their transport. We then get our first time-leap of someone named Jesse waking from a nightmare where it is implied that the rebellion failed. Seemingly back to our previous place in the timeline, Ryan speaks to his council, the Eurocons who oversee his dictatorship, and we learn of an alien subterranean race that is being collected and sent to an off-planet garbage collection site. Crom crushes the defiance on the transport, and with Inferno’s message to the rebellion leader Mariah, all pieces begin to move on Paris. Meanwhile, Newo returns to the Kilgannon house as a falling star, revealed to be Ambellina, crashes into the scene. Claudio remains on the ship, seeing these aliens firsthand and accidentally releasing one before they reach Shylos-10, the waste planet of Heaven’s Fence. A camp by the name of Si-Revody is where the genocide of these beings, referred to as ‘Stars’, takes place. Inferno joins in the fight against Crom with Coheed and Cambria to little effect, leaving Inferno impaled and the couple rendered unconscious. Back home, Newo is questioned by Ambellina while a transformed priest stalks the shadows. Newo finds a note left by Claudio before the attack, giving incentive for Albellina to protect the girl until she leads her to the man. As Ryan sends another priest to find Claudio, he continues his investigation of the Stars. One who attempted to escape is now being called a hero, dubbed the ‘Heartshot Kid’. At this point, the Prise, the Kilgannons in chains, and Mariah’s rebellion are nearly at Earth. The assault beings, and the flies are released. One stings Coheed, enraging him and turning him into the Monstar. He takes violent vengeance on Crom and Ryan tells Cambria that she will be the one to end him when this is over, calling her the ‘White Ruiner’. Ryan sits confidently on his throne as his plan continues to succeed as intended. The virus takes hold as the assault and rebellion trade blows, the Monstar fleeing and the White Ruiner giving chase. What was once Coheed lands on Star VII, snuffing the life from it, and the telepath comes to stop him. After a fierce battle, she opens the Monstar’s chest with a psychokinetic sword, takes the virus from him, and ends his life. Seeing that her power could not avenge her fallen love, she takes the sword unto herself. The dampened star disrupts the Keywork, causing the planets of that sector to disband, and the Ruiner uses her lifeforce to reignite the star. The newly-lit star’s gravity creates a more traditional solar system, but if left unchecked, it will slowly pull at the Keywork and cause the destruction of all planets among the Fence. Back on Earth, the Prise sacrifice themselves to restore energy to the Keywork, temporarily stabilizing the remaining planets of the Fence as the battle seems lost. Deftinwolf slits Mariah’s throat while on video communication with Jesse, and after informing Ryan that the priests are dead, is reinstated to his former position. Ambellina decodes Claudio’s letter back home, leaving Newo by herself. The aftermath of these events leave the Keywork held together perilously, our titular characters and the rebellion leader dead, the children scattered and broken, and Ryan an all-consuming power. Years later show Jesse, now a boxer, fanning the embers of the lost rebellion, and Claudio hiding in the sewers of Shylos-10. One of Jesse’s opponents, a surviving Prise, mentions awaiting The Crowing that will save the Keywork. While only a single year marks the aural space between Second Stage Turbine Blade and its follow up, IKSSE:3, an entire decade spans between parts of the story. Building on the more linear shape of the previous record’s plot, this is the point in which the narrative from a writing perspective comes into its own, theming itself around the idea of being an outcast. It’s also more linear in a literal way, making it much easier to follow. Our journey to The Crowing and the perilous state of the Keywork would also be chronicled in ink come May 2010, beginning what would become a set of 12 issues, two paperbacks, and eventually one collected hardcover. 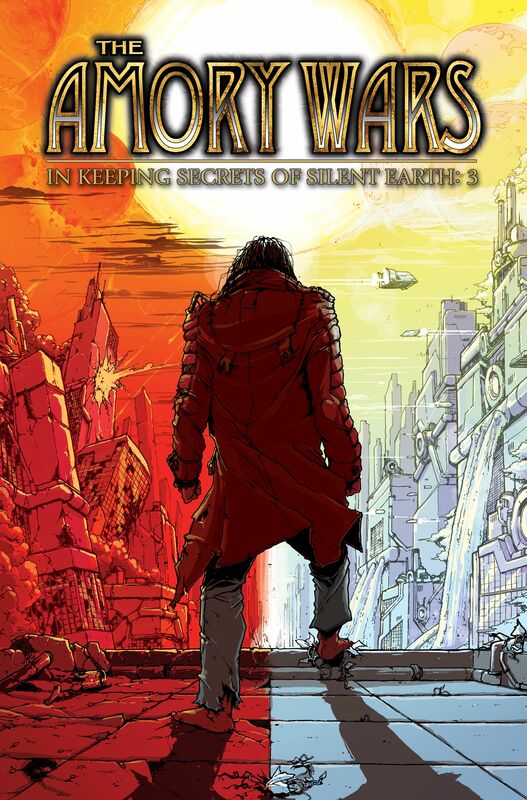 It’s worth noting that Claudio’s comic label expanded from here to included non-Amory Wars stories as well, such as Key of Z, Kill Audio, and Translucid. For our purposes, let’s stick to the record at hand! As the years push forward into this time jump, Claudio remains hidden on Shylos-10 while Jesse rebuilds Mariah’s rebel army and fights against Ryan’s URA from the planet Silent Earth: 3. A new set of IRO-bots called The Pioneers join the cause as they prepare for war. A robot love triangle manifests between Jesse and two new characters, Chase and Sizer, as they ‘man their battlestations’. Meanwhile, Ryan contemplates stealing one of the machines to interrogate for information. The battle begins as the fight between the URA and rebellion takes many lives. During the violent discourse, Chase is captured by the URA as per Ryan’s plans. Sizer, pining for Jesse’s affection, attempts to give himself up in Chase’s place. This works, and Sizer is taken away to Shylos-10 to begin a brutal interrogation. A drill is put through his hand before he is blinded and disassembled. Through all this he does not break, and he is discarded among the waste of the planet. He is found by Claudio and Ambellina, where upon Jesse takes him to be reconstructed. We learn that Ambellina was cast out from the Prise in order to watch over Claudio as he travels the path to become The Crowing. They discuss their intertwining fates and Claudio is told of his need to meet his destiny head on as he is the key to the end of the Keywork according to God’s riddle. He is then told of his family’s fate, of which he skeptically resolves to take revenge of Ryan. Jesse comes to speak to Claudio to confirm his new role, detailing Ryan’s plans, and leaving Claudio to struggle with what he has learned. In reaching Shylo-10 undetected, they had to give up their means of escape. Enlisting the help of a freighter pilot names Al, they board The Velorium Camper to leave the garbage planet behind. They learn of Al’s backstory as a sharpshooter and his borderline overbearing obsession with his sniper rifle. Ambellina dredges up memories for Al that lead him to obsess over the Prise before being rejected and swearing against love forever. Ambellina comes across a closet full of dead girls that illuminate Al’s sadistic hobby of fantasizing and murdering them with his sniper. Al returns the group to the rebuilt House Atlantic and seemingly betrays them by handing them over to the URA. Al’s new obsession with Ambellina convinces him to turn cloak one more time, using his sharpshooting skills to cover as the Claudio and company escape. Reuniting with the Grail Arbor, the group leaves safely. Claudio dreams of Newo and his telepathic abilities allows him to see the letters she wrote to him. His dreams take him through remorse for not saying goodbye, to anger of what his family has been through, to resignation at the idea of what would have happened if he had arrived home earlier. After reliving the horrors from “Everything Evil” in his dream, he resolutely proclaims his will for revenge. Coheed and Cambria are dead. The band’s namesake only lasting a fraction of the length of this space opera. Their actions causing the Keywork itself to be set on a course for destruction. Their children remain scattered, though Claudio has finally come to be the focus of this sudden tale of revenge. Jesse fans the flames of a fallen rebellion, and many friends are lost along the way. Come back next time where we finally introduce The Writer as we reach both parts of Good Apollo, and the conclusion to the furthest point on the current timeline. Till next time!